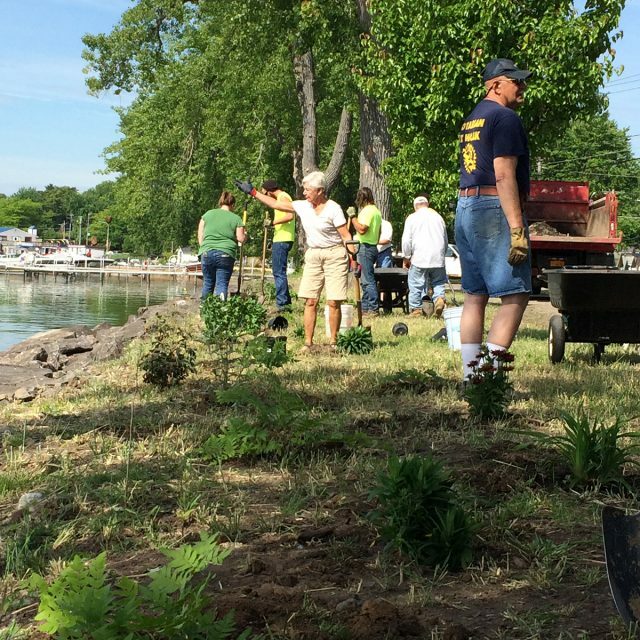 The Wickham Blvd ‘Rain Gardens’ in Sodus Point, NY were planted on July 16th. Village of Sodus Point landscape crew, Wayne County SWCD staff , Mayor Tertnick and volunteers from the Neighborhood Association, Rotary and Village neighbors pitched in to help plant the gardens. Rain gardens are just what they sound like; a regular garden in your yard filled with native plants and grasses that are designed to absorb water. Rain gardens are working gardens and are designed to slow down the rush of water from hard surfaces, hold the water for a short period of time, and allow it to naturally infiltrate into the ground. This helps keep clean, fresh rainwater out of the sewer system that could otherwise carry with it pollutants like oil, salt, fertilizer, and pesticides. Rain gardens are a beautiful and colorful way for homeowners, businesses and municipalities to help ease stormwater problems.